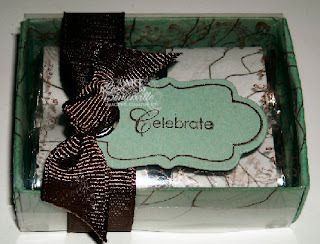 Earlier this week I received some of the new items in the Occasions Mini Catalog. One of the great perks of being a demo is getting product before it's actually available! This is another one of the items I made to go along with the Bloggers Challenge Color Challenge - still having photo issues though...Not only is it hard to photograph acetate, but the darn "e" keeps appearing like it's blurred in the photo, when IRL it is not. Anyhow, I used the new Matchbox Die cut from Sage Shadow, then randomly stamped my Fifth Avenue Floral in Sage and Chocolate. Note - I only stamped this on the side panels, not the bottom. Folded in my box on the score lines. Stamped my images again on Avery Label Sheets, peeled them off and adhered them to some Hershey Nuggets. 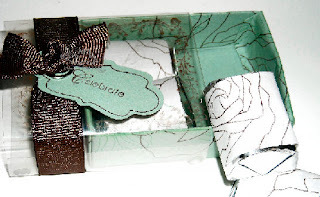 To create the cover for my box, I ran a Window Sheet through my Big Shot, using the Matchbox Die, stamped the border from the new Matchbox Messages Set (also in the Occasions Mini), added my glue dots to hold the lid closed, and slid in the bottom of my box. The sentiment comes also comes from Matchbox Messages, and also coordinates with the new Matchbox Die. I inserted a Silver Grommet (another new item in the Mini) and tied on my Chocolate Grosgrain Ribbon. Doesn't this make a cute favor! Thanks Lisa for this important tip. Have you mentioned this to SU? Oh my! This is wonderful! Can you see all of the summer brides bombarding you for these? Gorgeous!!!! Well this is SCRUMPTIOUS for sure! !